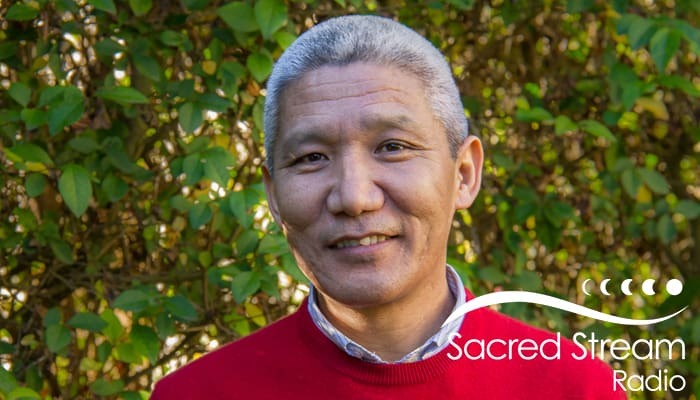 Description: This month Laura reaches back into the Sacred Stream archives for an interview she did with Thupten Jinpa when he was on his book tour for A Fearless Heart. The interview was impromptu and took place at Laura’s kitchen table, where she talked to Jinpa about his work with H.H. Dalai Lama, CCare, the Compassion Studies, and his perspective on generating more compassion in the world. This episode also contains a talk Jinpa gave at the Sacred Stream Center on Language and Reality. The featured music is from the Monks of Gaden Shartse Dokhang, Jinpa’s former monastery, and their album, The Sacred Chants of Tibet. Thupten Jinpa is the primary English translator to H.H. the Dalai Lama has translated and edited more than 10 books by the Dalai Lama. His own works include numerous contributions to various collections and academic journals and several works in Tibetan language. His latest works are Songs of Spiritual Experience: Tibetan Buddhist Poems of Insight and Awakening (co-edited with Jas Elsner), and Self, Reality and Reason in Tibetan Philosophy: Tsongkhapa’s Quest for the Middle Way. At present he is the president of the Institute of Tibetan Classics in Montréal, Canada, and the editor-in-chief of the translation project The Library of Tibetan Classics, being developed by the Institute. He is on the advisory board of various educational and cultural organizations such as the Mind and Life Institute (USA), The Orient Foundation (UK & India), The Meridien Trust (UK), Global Ethics and Religion (USA), and Manjushri Buddhist Online Community. He is also a Visiting Research Scholar at the Stanford Institute for Neuro-Innovation and Translational Neurosciences at Stanford University.